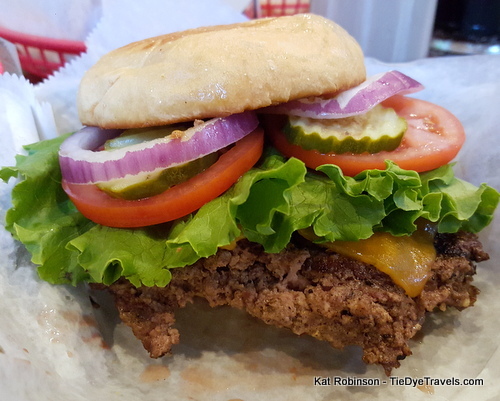 Road Eats: The Big Ugly Burger and More at Bub's Burgers in Zionsville, Indiana. 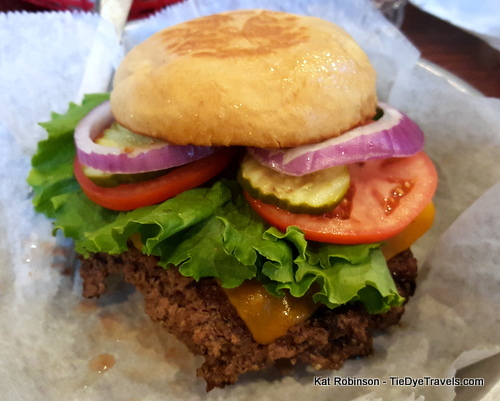 Almost a classic, this Indiana mainstay's fame comes from burgers with post-cooked weights, creamy shakes and walls decorated with those who have taken the Big Ugly Challenge. Now, I need to start this off with a couple of things. 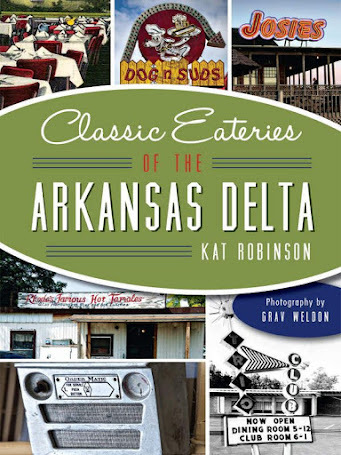 First, you may have heard about this place because Adam Richman happened to land here. 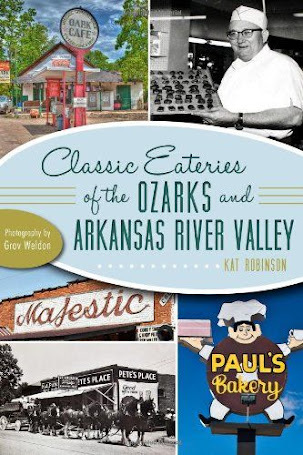 We do some crossover, and I've noticed the Food Network folks surfing my site. I'm cool with that, because that means more exposure for all those restaurants I have visited. 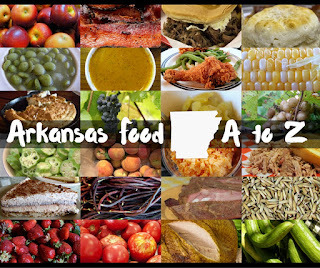 You know, Adam managed to do an entire Man Vs. Food show in Little Rock without visiting a single Little Rock restaurant (Scott, Cabot and Ferndale do not count and are not suburbs), but whatever, that might be a producer issue. And that cancelled ticket to see Mr. Richman when he visited my hometown? Probably just an error. 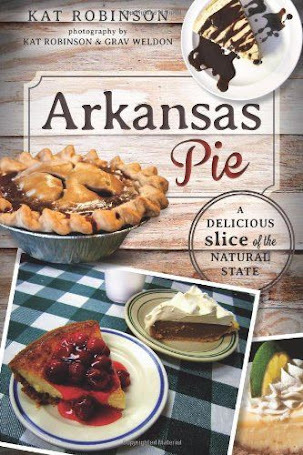 I contribute to Food Network Magazine from time to time, so no harm no foul. 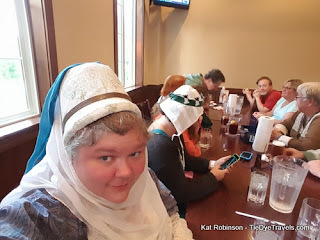 The second, completely unrelated fact is that I was in central Indiana for the 50th Year Anniversary Celebration of the Society for Creative Anachronism. 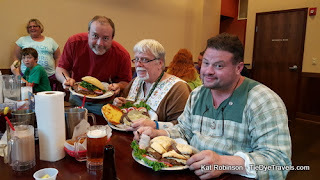 I've talked a little about my quarter century participation in the SCA, and I won't rehash it all here, but it figures into this story. Because frankly, I wouldn't have ended up in Zionsville on a Wednesday night if it hadn't been for my friends in the SCA. This all leads up to the fact that 18 of us showed up to dine on that particular Wednesday evening. A few had changed into t-shirts and such but most of us were in garb (our period SCA clothing) when we descended upon the restaurant. We were ushered upstairs to a semi-private room, where two waitresses took our orders and left us to our own devices. 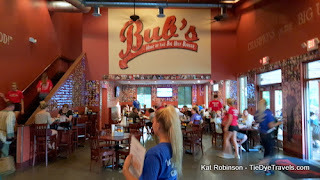 Bub's Burgers started in Carmel, Indiana in 2003, the brainchild of Matt and Rachel Frey and Matt's brother-in-law Chuck Lazzara. Bub is Matt's nickname. The operation centers around hand-patted burgers on locally made buns, though grilled items, salads and such are also available. 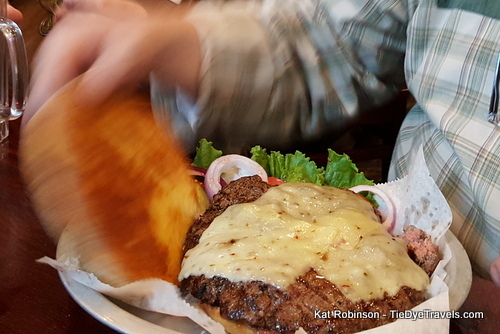 The big difference between regular burger menus and Bub's is the weighing of said burgers. When you order a quarter pounder, you're ordering a quarter pound of beef that hasn't been cooked yet. 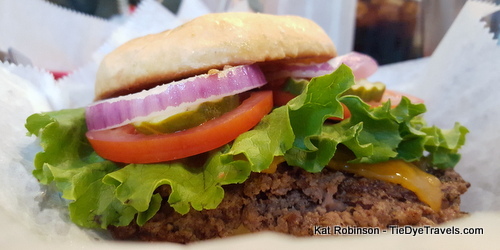 The weight of that burger lessens as water and grease work their way out during the cooking process. The end result is a quarter pounder that's not a quarter pound - not unless vegetation, condiments, cheese and bun make up the difference. At Bub's, that lost weight is taken into account. So the burger patties are actually closer to the advertised weight AFTER they've been cooked. And the burger the place is known for, the Big Ugly, starts with a 22 ounce nicely seasoned ground chuck patty. You can see the difference in the case up front. This is important. Stay with me. 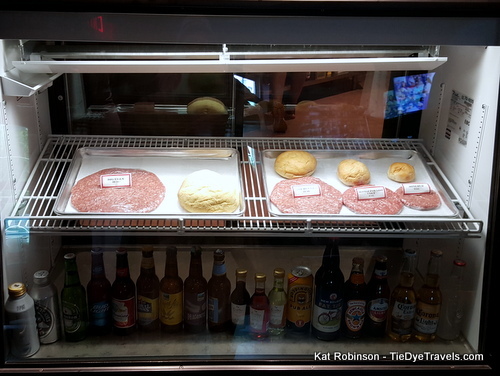 Burgers come in a variety of sizes and a variety of meats. 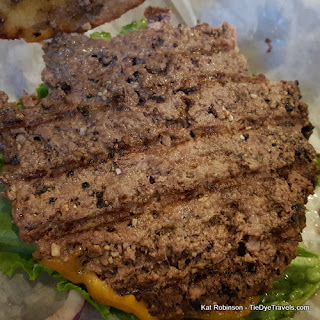 In addition to the Big Ugly, there's a Not So Ugly half pounder, the Settle For Less Ugly quarter pound and the Mini Bub, an eighth of a pound. 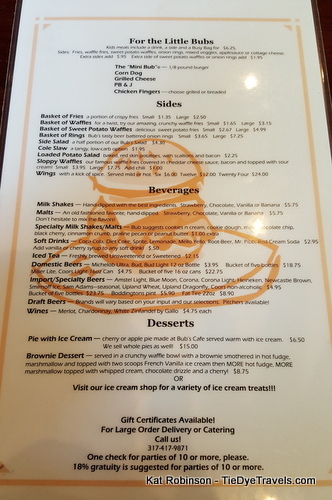 All these options are also available as elk burgers, for just a bit more. They come on custom made buns from Lucy's Bakery. There are also hot dogs and chicken, mahi-mahi and portabello mushroom sandwiches. 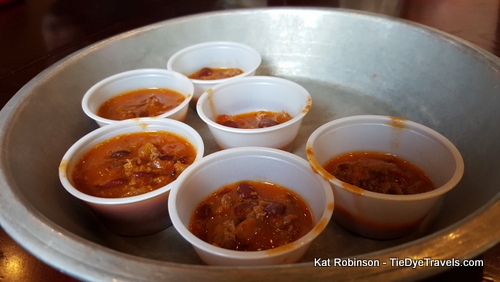 When we sat down, wait folks brought us these pans full of chili shooters. Yes, I thought this was odd at first, but it makes sense. They push the chili here, and it's good chili - chunky and full of vegetables and beans like my own, with a nice, almost Cincinnati flavor twang underneath. However, when I went to order my burger and asked for chili upon it, I was regarded with the sort of look you give a small child who has asked for gummy worms and cheese dip on his meatloaf. 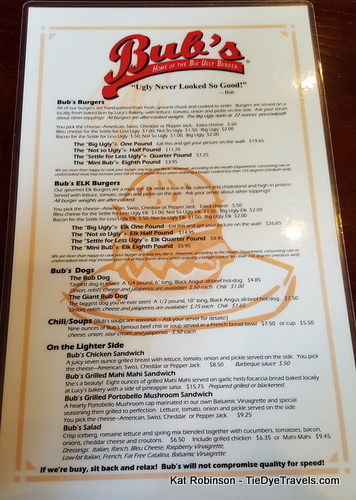 Apparently, chili on the burger is not a thing at Bub's. Hey, Bub's folks, if you decide to get about doing that, remember, I'm cool with you naming it after me. We all placed our orders and relaxed in the air conditioning and chatted about. Milkshakes came to the table first. 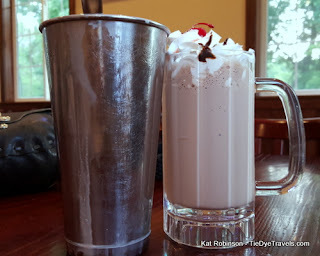 I had several recommendations to try the handcrafted milkshakes, and I was not disappointed. Somehow, there seems to be a higher milkfat concentration with Bub's milkshakes. They're ridiculously creamy without being overly heavy, with not too much sweetness. I was automatically won over. 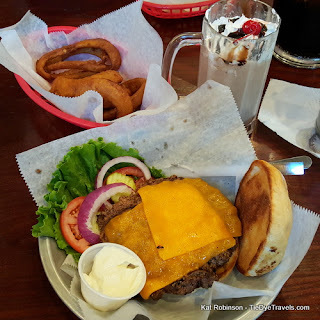 on the top, vegetation comes on the side, and every burger is cooked to order (Indiana doesn't seem to have the issue with this like Arkansas does). There were grunts of approval all around, laughter and challenges galore. marks and a nice warm reddish pink center. Excellent. It came with these nice crunchy dills, tomatoes (okay but not as flavorful as the Arkansas varietals I am used to), green leaf lettuce and slices of red onion. The bun deserves note. The top bun had been buttered and left to lay on the griddle, rendering it almost hard in its crispiness. I mean, there was a LOT of butter there. The bottom bun was still untoasted, soft and pliant. 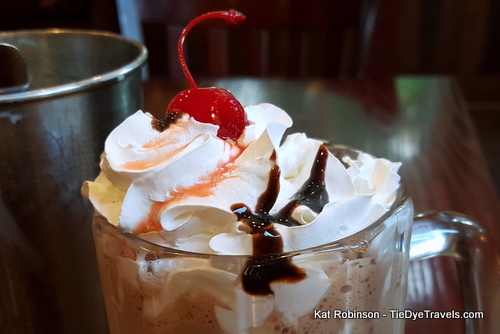 It created an unusual dichotomy and a nice unexpected crunch. 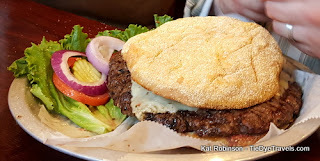 I ended up eating the whole affair upside down to preserve the formation - anything else would have resulted in burger form failure and I'd have had to pick at it with a fork. 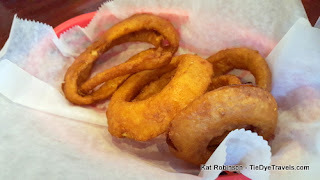 The onion rings were beer battered and pretty decent. My small batch came out darker than the full order down the table from me, but that was okay. They were good with a little ketchup. I was able to take my photos and consume my burger without attention for once, since my friends were all going at these huge burgers. And they all finished, which meant they were photographed and added to the walls. Which is funny, since we were all wearing our SCA garb and having a good time. I suspect someone along the way will look up at that photo and wonder "why the funny clothes?" We shut the place down, sticking around until after 9 p.m. chatting and enjoying ourselves. I'm going to have to come back and try the Giant Bub Dog. It's billed as The biggest dog you’ve ever seen! A 1/2 pound, 10” long, Black Angus all-beef hot-dog. Oh yeah. You don't have to eat a burger or dog when you go to Bub's. 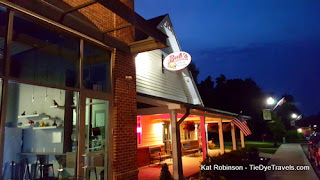 A whole section of the restaurant is set aside as an ice cream parlor. But as I said, we'd shut the place down. And I only managed half that Not So Ugly burger. But I did drink all of my shake. And I did it, wearing this get-up. If you're interested in learning more about the SCA, check out the SCA website or drop me a line with questions. You'll find this location of Bub's Burgers and Ice Cream at 620 South Main Street in Zionsville, Indiana. 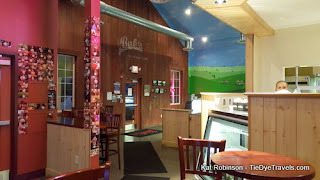 There are also locations in Carmel and Bloomington. 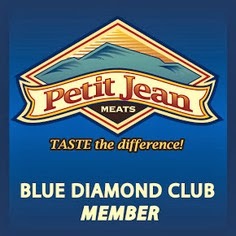 All three locations are open 11 a.m. to 10 p.m. every day. For more information, call (317) 344-0927 or check out the eatery's website.